Floodplain | First Base Solutions Inc.
Regulatory flood line mapping defines the 100-year storm event for lakes and rivers in the Toronto area. Predicted high water levels and historical observations from Hurricane Hazel can be used to estimate risk. Portions of flood plain mapping are currently in “DRAFT” status and are temporarily unavailable for purchase. 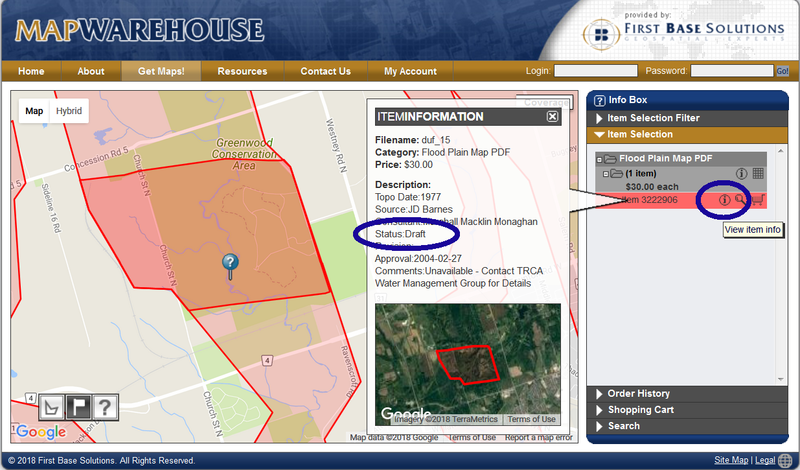 Check the file info on MapWarehouse to confirm the map status is “FINAL” to ensure a successful transaction. If you’ve purchased a draft file or your file contains no data, please contact us for help. Search for data, select files covering your location, download your order, and work with aerial imagery and geographic data. Use the interactive map to locate your area of interest and purchase multiple data sets easily and quickly with a credit card. First Base Solutions can help you retrieve flood line mapping found on MapWarehouse covering large or complex areas. Contact customer service for assistance. Blog: To develop, or not to develop in the floodplain? Regulatory flood line mapping is used to assess risk and develop mitigation strategies in populated areas vulnerable to flooding. It informs policy makers to design city infrastructure equipped to handle overflow from major storms. Improve accuracy, integrity and completeness of your data library to enhance your day to day operations. Research land characteristics of remote sites and forecast resource potential without visiting. Make educated assumptions before a shovel hits the ground by using reliable engineering grade data.